Bright Morning Star (DD, NH/CD); Betsey Lichens (DD, DG); They Obeyed (DD); Brushy Run (DD, DG); Hiram Herbert (DD); Old Mother Flanagan (DD, DG); Shady Grove (DD); Would Not Be Denied (DD, unidentified harmony vocal); Lone Pilgrim (DD); West Fork Girls (DD); Lisbon (DD, NH/CD); Abe's Retreat (DD, DG); Jordan's Stormy Banks (DD, unidentified string bass and harmony vocal); Ducks on the Pond (DD, DG); Sweet Hour of Prayer (DD, SS, unidentified string bass); Muskrat (DD, Peter on Bones); Liza Jane (DD, DG, Peter on Bones); John Hardy (DD); Sandy Boys (DD, Laura on Fiddle); Shelter in a Storm (DD, NH/CD). There isn't a great deal about Dwight Diller himself on the booklet that accompanies this record. But further information is available on his web-site (www.dwightdiller.com) - including the fact that he plans to visit England in late November/December 1999. 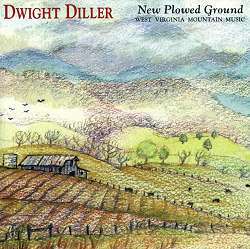 Dwight's ancestors were among the first Europeans to settle in central West Virginia, and for thirty years or so he has collected and performed the traditional music and songs of his native region. He learned much from the Hammons family (who have a remarkable musical heritage of their own - see article on this site), and was instrumental in getting them recorded by the Library of Congress in 1968. Dwight now combines his activities as a musician and teacher with his vocation as a pastor in the Mennonite Church. The selections on this recording fall into three categories. There are hymns, performed without instrumental accompaniment in the style of Southern mountain congregations. There are traditional fiddle and banjo tunes. And there are songs of various types, mostly sung by Dwight alone, accompanying himself on the banjo - but sometimes with a fiddle in support, or with added vocal harmony. Some of this material is not immediately appealing to the unprepared ear; but repeated listening reveals hidden treasures. The instrumental pieces are also deceptively simple. Played at a moderate pace, and without elaborate ornamentation, they still grab the listeners' attention because they are delivered with perfect timing, and total conviction. At first, the fiddle may sound raw and harsh - as far from the sweet singing tone favoured in Nashville as moonshine is from Jack Daniels. But give your ears time to adjust. Whenever you travel, you should always sample the wine of the country. It's bound to be an educational experience, and you may eventually acquire a taste for it (sound clip - Old Mother Flanagan). This distinctive instrumental flavour is enriched on some tracks - Muskrat for instance - by Dwight's use of the gourd banjo. It sounds as though it has a fretless neck, and is strung with gut, like the home-made instruments of some older mountaineers (though we aren't told whether somebody had to catch and skin a possum to make the vellum). But whatever the details of its construction, it delivers a deep-throated sound that's rhythmically potent - if slightly hazy as to pitch - and drives the songs along with tremendous vigour. The songs themselves are a mixed bag - some cheerful, others seriously grim. Like the fiddle tunes, they sound rough-hewn and unpolished at first hearing, but grow on you after a while. Think of John Hardy or Hiram Herbert as story-telling supported by music, rather than as displays of vocal or instrumental virtuosity, and they being to reveal their subtlety. (sound clip - John Hardy). Perhaps we're too sophisticated now to appreciate these songs in the same spirit that the pioneer folklorists did, almost a century ago. They saw the mountain balladeers as links in a human chain, leading back to forgotten bards at far-away firesides, plucking on unspecified stringed instruments while they chanted the adventures of Beowulf, Cuchulain, or Odysseus. Whereas we post-moderns all know that their universal-family-of-man-joined-in-song theory was only a foolish fantasy - a blend of the Fabian Society's unworldly benevolence with the anthropological speculations of Sir James Frazer's Golden Bough, heavily marinated in Romantic nostalgia and Victorian sentimentality. Yes, we know all that ... and yet ... and yet ... if you close your eyes and listen carefully, you can almost hear the crackle of the fire, and smell the wood-smoke. Concentrate a little harder, and you might just be able to taste the mead (or moonshine), and hear the thegns (or good ol' boys) snoring as the scop (or banjo-player) drones on - but still with hand on sword-hilt (or six-shooter), just in case there really is a Grendel (or Revenue Officer) out there in the dark. Well, we can still dream, can't we? And perhaps we do need to slip back into the dream-time now and then, to help us keep a grip on reality ... whatever that is. Yew Pine Mountain Music - Tel: 304-653-4397. No price stated.